3. Follow up of the focus group discussion in Brussels organized by EPSO in co-operation with the Scientific Institute for Quality of Healthcare (IQ healthcare) of the Radboud University Nijmegen to Identify best practices to deal with impaired and incompetent health care professionals. At the Brussels conference and afterwards the researchers have - together with EPSO members from various interested countries - set steps forward to gain more insight in successful strategies on how to adequately prevent and deal with impaired and incompetent health care professionals . Tijn Kool and Jan Willem Weenink (IQ health care) will present the first research results of a large national survey. This survey explores whether there are significant differences between the major professional healthcare groups in the Netherlands, regarding (1) their experiences with impaired or incompetent colleagues, (2) the reaction of healthcare professionals on these experiences and (3) their attitude towards the responsibility of dealing with impaired or incompetent colleagues. This information might provide insight in the ability of these disciplines to self-regulate. The Francis Report on the Mid Staffordshire case and also the so called Winterbourne case have shown that regulators and supervisory bodies will have to find sensitive methods to prevent and report these kind of serious incidents. Glenn Houston Chief Executive Regulation and Quality Improvement Authority HQIA will reflect on these cases and the implications for regulators and supervisory bodies. Presentation by and discussion with Nathalie Chaze, DG SANCO, Head of Unit, European Commission, on the topic of effective implementation of the DIRECTIVE 2011/24/EU OF THE EUROPEAN PARLIAMENT AND OF THE COUNCIL of 9 March 2011 on the application of patients’ rights in cross-border healthcare (Friday morning). • What will be realized of the European plans to give Europeans the right to seek healthcare abroad more easily and be reimbursed for the costs? • How will patients be properly informed about their rights (including information on the quality of health care institutions and doctors) when they are treated outside their home Member State? • How will doctors and care institutions be properly informed about the rights of people coming from abroad from other European Member States? • Will inspectorates, regulators and monitoring bodies get involved in this process? • How could inspectorates, regulators and monitoring bodies prepare themselves for these developments and support this process at EU level? Follow up on the EPSO working group on ‘Restraints and Coercive methods in long term nursing care and hospitals’. The working group will present a first draft of an ‘Assessment and Evaluation Framework’ which could be used by the various EPSO Member countries to reduce the use of force and improve care in the area of restraints and coercive methods (Thursday afternoon). The Framework aims for better care and less unnecessary force by giving people more say in decisions about their own life and by doing so reducing unnecessary restraints, unnecessary violence (force) and unnecessary restrictions of freedom in healthcare- and other institutions. The idea of the working group is that supervisory bodies can learn and improve by using best practices and comparing their own working methods with relevant experiences in other States/Regions and with relevant norms and accepted standards. The draft Framework that will be discussed in Brussels is based on best practices and working methods in various EPSO Member States and is related to the basic Human Rights approach used by the Council of Europe’s CPT (“European Committee for the Prevention of Torture and Inhuman or Degrading Treatment or Punishment”) in the area of restraints and coercive methods in healthcare and restricted care. • What are the possibilities for the use of an assessment framework in the different countries? • Is there a country/ region interested in being pilot for developing an assessment framework in practice? Presentation by members of the EPSO working group on Restraints and Coercive methods: Eve Pilt (Estonia), Marjolein van Vliet (VILANS), Krist Debruyn (Flanders), Dirk Meijer(EPSO),Jooske Vos( EPSO). - Police Custody, (Thursday afternoon). Presentation by Her Majesty’s Chief Inspector of Prisons for England and Wales, Nick Hardwick (Inspector general National Prevention Mechanism- UK). 3. User participation (Thursday morning).  Recent developments on User participation in Flanders: How Zorginspectie involved young detainees in juvenile detention institutes in the inspection processes, Krist Debruyn , Zorginspectie Flanders (Flanders).  User participation by EPSO members including user participation in Northern Ireland with patients involved in Electroconvulsive Therapy. A Follow up on based on the results of the EPSO working group ‘User participation and engagement in the inspection processes’ as presented at the Utrecht conference; An update will be presented by Theresa Nixon (Northern Ireland).  Plenary discussion of EPSO members on best practices in user participation by supervisory organisations in the various EPSO member states. The panel will use its experience to give comments and reflections in response to the presentations above. An overview document about existing practices in 9 EPSO countries/regions will be available. Panel: Anita Bashar Aréen, National Board of Health and Welfare (Sweden); Kees Reedijk ,Youth inspectorate (Netherlands); Theresa Nixon, RQIA (Northern Ireland); Patricia Gilheaney, Mental health Commission Ireland (Rep Ireland); Krist Debruyn, Zorginspectie Flanders (Flanders). 4. Media and Supervisory Organisations (Friday afternoon). A follow up study on dilemmas that emerged from the study of opinions of EPSO members as presented at the Utrecht Conference by prof. Mark van Twist and Jorren Scherpenisse (NSOB, The Netherlands). c. find methods and attitudes to develop the right media strategy in supervisory cases. 5. Quality Indicators (Thursday afternoon). European and Australian reactions to the New Zealand Indicators engagement and feedback document. The New Zealand’s governmental supervisory organisation (The Health Quality and Safety Commission) has presented an interesting first set of Health Quality and Safety Indicators including questions about the use and aims of the indicators. Some EPSO members were asked to give their personal reactions to this indicator document. Richard Hamlin co co-author of the document and Head of Intelligence at the New Zealand Health and Quality Commission will give a short introduction . Neil Prime will from the first reactions of some EPSO members, present some dilemma’s and questions emerging from the New Zealand ‘document ‘. This will include questions about the use of indicators as instrument in measuring risk and quality of healthcare and improving quality of care. Mark Brandon, Convenor of the ISQua ( International Society for Quality in Health Care) Special Interest Group on Quality and CEO of the Aged Care Standards and Accreditation Agency in Australia has been asked to give a short reaction and to participate in the panel. 6. Unannounced inspections (Friday morning).  Flanders Zorginspectie has developed an interesting new policy for unannounced inspections in hospitals (start in 2013). The new model will be presented by Tania Vandommele Zorginspectie Flanders (Flanders).  ‘Unannounced Mystery Guests’: a useful instrument in addition to the traditional supervisory activities? Presentation on a the outcome of a recent research project on the effect of the so called mystery guest in the Netherlands , Samantha Adams, Assistant Professor at the institute of Health Policy and Management (iBMG) Erasmus University Rotterdam and Corry Ketelaars (The Netherlands). 7. Focus Group: Identifying best practices to deal with impaired and incompetent health care professionals by Hanneke Drewes (project leader IQ health care). The focus group is an optional part of the programme and is open to all interested EPSO members (Thursday morning). Many governments and health care inspectorates struggle to adequately prevent and deal with impaired and incompetent health care professionals. To gain more insight in successful strategies EPSO organizes in co-operation with the Scientific Institute for Quality of Healthcare (IQ healthcare) of the Radboud University Nijmegen, a focus group discussion at the Brussels conference. The aim of this session is to briefly inform the participants in the EPSO Focus Group about various existing strategies to prevent and deal with impaired and incompetent health care professionals in our countries. Subsequently, we will interactively discuss the pros and cons of these different strategies in order to gain insight and learn lessons from each other. The results will be made available to the participants and afterwards published in an international publication. This focus session will start at Day 1 directly before lunch (11.15-12.15) and is open to all interested EPSO members. 8. Friday afternoon programme: ‘Meet the Brussels of the European Parliament’ (Friday afternoon). Those EPSO delegates who are interested in the functioning of the European Parliament (EP) and in the EP activities on Active Ageing – for inspectors and health supervisors one of the interesting upcoming topics of the ENVI commission of the European Parliament - are warmly invited to take part in this Friday afternoon programme. First we organize a visit (guided tour) to the Parlamentarium with Bart Staes, Member of the European parliament. Afterwards we will have a short presentation and discussion with Kartika Tamara Liotard, Member of the European Parliament and Rapporteur for the Parliament on the topic of ‘Active Ageing’. The EP document on Active Ageing and some for inspectors- supervisory bodies relevant questions will be available for the participants of the Friday afternoon programme. The final version as accepted by the European Parliament is included in the programme booklet. This document will be sent to the Member States with the positive advice(Communication) to take measures on Active Ageing. Therefore it might be interesting to discuss with Kartika Liotard and Bart Staes how Inspectorates can or cannot contribute to include Active Ageing in health care supervision or monitoring. We hope for an active discussion between the EPSO members and two Members of European Parliament on this new European topic of Active Ageing. 14.45 From Sheraton to museum by metro. Those who want to join please gather in time in the hotel lobby. 15.15 Meeting of the Early bird group at the Gresham entrance for groups: Musées Royaux des Beaux-Arts de Belgique , Place Royale 3, 1000 Bruxelles/ Koninklijke Musea voor Schone Kunsten van België/ Koningsplein 3 -1000 Brussel/ Museums for Fine Arts of Belgium. The Gresham entrance for groups is between the Museum Brasserie and the Museum shop. Regentschapslaan 3, Brussels. Dinner) will be at your own choice; Full menu price will be about 35 euro, excluded drinks. • 8.15-8.30 Gathering in hotel lobby to take ‘metro’ to conference location (accompanied by Zorginspectie). • 9.00 - 9.10 Registering of the EPSO delegates. • 9.10 - 9.15 Welcome by Geir Sverre Braut (president EPSO). • 9.15 - 9.30 Opening remarks Highlighting of the position of Zorginspectie as supervisory organisation in Flanders, by Zorginspectie Flanders. • 9.30 -10.00 Recent developments on ‘User Participation’ in Flanders: How Zorginspectie involved young detainees in juvenile detention institutes in the inspection processes, by Krist Debruyn, Zorginspectie Flanders . • 10.00- 10.30 User participation by the EPSO members including User participation in Northern Ireland with patients involved in Electroconvulsive Therapy. Follow up based on the outcome /results of EPSO working group on User participation and engagement in the inspection processes as presented at the Utrecht conference. Theresa Nixon will present best practises, challenges and follow up questions. • 10.30- 11.00 Panel discussion User participation led by Theresa Nixon (RQIA); A panel of EPSO members will start a plenary discussion on best practices in user participations by supervisory organisations in the various EPSO member states. The panel will use its experience to give comments and reflections in response to the presentations above. Panel led by Theresa Nixon (N Ireland); Panel members: Anita Bashar Aréen, The National Board of Health and Welfare( Sweden), Kees Reedijk, Youth inspectorate (Netherlands) , Patricia Gilheaney, Mental health Commission (Rep. of Ireland), Paul Robben IGZ (Netherlands), Krist Debruyn Zorginspectie Flanders (Flanders). • 11.00 -11.15 Break Tea/ Coffee. • 11.15 - 12.15 Focus Group: Identifying best practices to deal with impaired and incompetent health care professionals by Hanneke Drewes (IQ health care). Many governments and health care inspectorates struggle to adequately prevent and deal with impaired and incompetent health care professionals. To gain more insight in successful strategies EPSO organizes in co-operation with Scientific Institute for Quality of Healthcare (IQ healthcare) of the Radboud University Nijmegen, a focus group discussion at the Brussels conference. The aim of this session is to briefly inform the participants in the EPSO Focus Group about various existing strategies to prevent and deal with impaired and incompetent health care professionals in our countries. Subsequently, we will interactively discuss the pros and cons of these different strategies in order to gain insight and learn lessons from each other. The results will be made available to the participants and afterwards published in an international publication. This focus session will start at Day 1 directly before lunch on Thursday morning and is open to all interested EPSO members . - Police Custody; Presentation by Nick Hardwick (Inspector general NPM -UK). Mr. Hardwick will focus his presentation on the NPM findings in Health and Social Care settings and the recommendations of the NPM report. He is asked to give a first reaction to the draft EPSO framework on restraints and coercive methods(AEF). • 14.30 - 14.45 Follow up on the EPSO working group on Restraints and coercive methods in long term nursing care and hospitals (working group members: Eve Pilt (Estonia)chair, Dermot Parsons (Northern Ireland), Anja Jonkers ( Netherlands) , Thijs Melchior (Netherlands) Audrey Murphy , Theresa Nixon ( Northern Ireland )Marjolein van Vliet (VILANS), Krist Debruyn (Flanders), Dirk Meijer , Jooske Vos(EPSO). Eve Pilt (Estonia) will on behalf of the working group present a first draft of an ‘Assessment and Evaluation Framework (AEF) aimed to be used by EPSO Members in their own national practice. This first draft Framework is still a discussion model but is meant to become – after discussion within the EPSO context- an instrument to reduce the use of force and improve care in the area of restraints and coercive methods. The Framework will be based on best practices and working methods in the various EPSO Member States and is related to the basic Human Rights approach used by the Council of Europe’s CPT (“European Committee for the Prevention of Torture and Inhuman or Degrading Treatment or Punishment”) used in the area of restraints and coercive methods. • 14.45-15.00 Discussion Questions that will be discussed include: Could this framework be a useful instrument? What is still missing? What are the possibilities for the use of the Framework in the various EPSO countries? Is there a country or region interested in being pilot for developing this assessment framework in practice? • 15.00 - 15.30 European and Australian reactions to the New Zealand Indicators engagement and feedback document. The New Zealand’s governmental supervisory organisation (The Health Quality and Safety Commission) has presented an interesting first set of Health Quality and Safety Indicators including questions about the use and aims of the indicators. Some EPSO members were asked to give their personal reactions to this indicator document. Richard Hamlin (New Zealand) co-author of the document and Head of Intelligence at the New Zealand Health and Quality Commission will give a short introduction . Neil Prime (England) will from reactions of some EPSO members, present some dilemma’s and questions emerging from the New Zealand ‘document ‘. This will include questions about the use of indicators as instrument in measuring risk and quality of healthcare and improving quality of care. Mark Brandon (Australia) has been asked to give a short reaction and to participate in the panel. • 15.30-16.00 Panel discussion and Plenary feedback on Quality indicators led by Neil Prime. Panel members: Neil Prime (England), Richard Hamblin( New Zealand), Mark Brandon ( Australia) , Anne Mette Dons ( Denmark). • 16.00 - 16.10 Break Coffee /Tea. • 16.10 - 16.20 Preparing for the Copenhagen EPSO conference on 17th and 18th of September 2013; Short presentation about programme and practical issues by Anne Mette Dons. • 16.20 - 16.30 Preparing for 4 Nations Conference England, Scotland, Wales and Northern Ireland; Short Presentation by Neil Prime. • 16.40 - 16.50 Bruno Lucet (France) will propose to establish a new EPSO working group on the Risk Assessment topic in relation to the selection of supervisory activities in Healthcare and Social Care. Further to the discussion, in Utrecht, about the risk matrix and IRIS program of IGZ ,which is aimed to support evidence and risk based selection of inspection cases, it could be interesting to establish an EPSO working group on this topic, in order to share our experiences and to deepen our knowledge. This group could aim to establish an inventory of the experiences in the various EPSO member states, to deepen the conceptual framework and to analyse tools and methods available on the risk assessment topic. Interested EPSO members are being asked to join the group (see conference booklet). - Further: what comes up; additional items; ideas; suggestions. - Welcome to new Secondary Members: Youth Inspectorate , the Netherlands and Mental Health Commission, The Republic of Ireland. • 17.00 Evaluation and Closing remarks by EPSO president Geir Sverre Braut. • 18.10 - 18.15 Delegates are being asked to join the group in the hotel lobby. • 18.15 - 19.45 Guided walk to the site of the conference dinner The walk is organized by the Flemish Zorginspectie and is provided by a guide of “Klare Lijn” (www.klarelijn.be). While walking from the hotel to the site of the conference dinner a guide will give in a loose way interesting information about Brussels and its inhabitants and will show some of the many highlights of the historic centre of Brussels. The walk will take about an hour and a half. 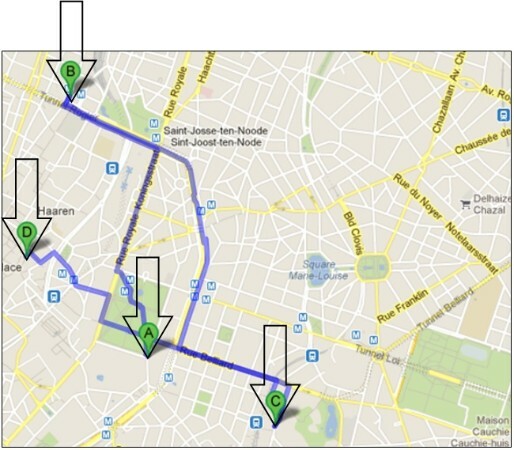 The guided walk will end at the ‘Taverne du Passage’, Koninginnegalerij/ Galerie de la Reine 30. Those who prefer not to walk can take a taxi or public transport to the dinner site. • 20.00 - 23.00 Conference Dinner offered by Zorginspectie at the ‘Taverne du Passage’, Koninginnegalerij 30, Galerie De la Reine 30, Brussels (close to the Central Market Square of Brussels: “Grote Markt” (see map). 8.30 - 9.15 EPSO Board Meeting (for board-members only). • 8.30 - 8.45 Gathering in hotel lobby to take ‘metro’ to conference location (accompanied by Zorginspectie). • 9.15 - 9.30 Morning Coffee and Welcome by Geir Sverre Braut, president of EPSO. • 9.30 - 10.00 Effective implementation of Patients’ rights in cross-border healthcare; Recent developments. Presentation by Nathalie Chaze, DG SANCO, Head of Unit, European Commission, on the topic of effective implementation of the DIRECTIVE 2011/24/EU OF THE EUROPEAN PARLIAMENT AND OF THE COUNCIL of 9 March 2011 on the application of patients’ rights in cross-border healthcare. - what will be realized in practice of the European plans to give Europeans the right to seek healthcare abroad more easily and be reimbursed for the costs. - How will patients be properly informed about their rights (including information on the quality and safety of health care) when they are treated outside their home Member State. - Will comparable quality assessments of hospitals and medical personnel be available cross border in Europe? - How will, should or could inspectorates get involved in this process? Could a network of inspectorates be of any help by organizing a supervisory framework cross-border? • 10.45 - 11.05 Unannounced inspections in Hospitals in Flanders: An interesting new policy. Zorginspectie has developed an interesting new policy for unannounced inspections in the hospitals (start in 2013). The new model will be presented by Tania Vandommele, Zorginspectie Flanders (Flanders). • 11.05 -11.25 ‘Unannounced Mystery Guests’: a useful instrument in addition to the traditional supervisory activities? Presentation of a Research project by Samantha Adams, assistant professor at Erasmus University Rotterdam and Corry Ketelaars Netherlands . • Mandy Collins(Wales) will unfortunately not be able to join us at the Brussels conference , but she will share her practical experience on the topic of ‘unannounced inspections’ in Wales by pointing out some best practises used in Wales to profit from the positive aspects of unannounced inspections and avoid the negative points. • 11.25-11.45 Discussion on pros and cons of unannounced inspection, led by Corry Ketelaars. • 11.45-12.00 Closing remarks Geir Sverre Braut, president of EPSO. • 13.45 -14.30 Media and Supervisory Organisations: “ Impact enhancement and damage control through media management”; A Follow up on Questions and Research plan on Media and Supervisory organisations presented by prof. Mark van Twist and Jorren Scherpenisse . Dilemma’s that emerged from the study of opinions of EPSO members as presented at the Utrecht Conference by prof. Mark van Twist (NSOB, The Netherlands). How do we find the right media strategy in supervisory cases and how can we learn from the dilemma’s found in the Utrecht study? • 14.30 Closing remarks by Geir Sverre Braut. • End of the Main Conference . (in co-operation with Kartika Liotard and Bart Staes, respectively Member and Substitute Member ENVI Committee of the EP). This Friday afternoon programme is organized by EPSO and by Zorginspectie in consultation with MEPs who are member respectively substitute member of the Environment, Public Health and Food Safety (ENVI) Committee. This part of the programme is designed to give on the one hand the EPSO delegates the possibility to get in contact with the European institutions eg. Members of the European Parliament and to offer them the possibility to have an exchange of ideas on the new European topic of Active Ageing . On the other hand it offers the participating MEP’s some insight in the working methods of supervisory bodies in Europe and can give possibilities of getting in contact and maybe work together in the field of health and social care. Occupational medicine; Health services, medical institutions. To promote an active exchange of ideas we selected for this Friday afternoon the topic of ‘Active Ageing’ as a topic that might be interesting for as well Supervisory bodies as well for the MEP’s who could be present at this Friday afternoon. The Active and Healthy Ageing programme is taking forward the strategic Implementation Plan of the European Innovation Partnership on Active and Healthy Ageing as launched by the Commission in the Communication from the Commission to the European Parliament and the Council (Brussels 29.2.2012 COM (2012)83 Final).This document will be discussed from the perspective of the Health inspectorates as well as well as from the MEP perspective. 14.45 Delegates who want to participate in the Friday afternoon programme are requested to join the group and go by metro from the Paleis der Academiën, Hertogsstraat 1 to the Parlamentarium building. 15.00 Meeting of the EPSO delegates and Bart Staes (Member European Parliament) in front of the Parlamentarium Building. 15.00 - 16.00 Guided tour in the Parlamentarium under guidance of Bart Staes (Member European Parliament) and Gerda Schotte ( Zorginspectie Flanders). 16.00 -17.00 Short presentation on the discussion topic: Active and Healthy Ageing by Kartika Liotard (Member European Parliament and ‘rapporteur’ for the parliament on this topic ) , followed by short reaction from the Australian Active Ageing experience by Mark Brandon, Convenor of the International Society for Quality in Health Care Special Interest Group on Quality and CEO of the Aged Care Standards and Accreditation Agency (Australian supervisory organisation), discussion. For the final document on active Ageing and some questions that arise on this topic from the inspectorate perspective: see conference booklet.